To view 20 more pictures, interactive maps and the full, detailed description of the The Retreat at Greenbrier (55+) community, please Login. Resort living in the new construction community, The Retreat at Greenbrier, gives condo buyers something to cheer about. Purchase a townhouse, quad-style home or single-family house and get five-star amenities in this active adult complex. Homebuyers ages 55 and older can relax knowing they’ve found their Shangri-La within Hampton Roads. These homes are located near the Greenbrier section of Chesapeake, VA, which allows easy access to shops, churches and libraries. Veterans will also be close to the Coast Guard Exchange and military bases like Naval Medical Center Portsmouth and Naval Air Station Oceana. The new construction homes in this development vary in shape and style to cater to a wide variety of tastes. The typical townhouse ranges from just over 2,000 to a little more than 2,500 square feet and comes with three bedrooms and two bathrooms. Quadruplexes begin right around 1,402 square feet and offer two bedrooms and two bathrooms. Single-family houses in The Retreat at Greenbrier offer one level living starting in the 1,670 square feet range. The Retreat at Greenbrier is for folks who want to stay active doing what they enjoy. One of the best benefits about condo ownership is not being a slave to your townhouse. Use that time to pursue other interests and develop better habits. Gardening with friends produces the best harvest; so come join neighbors in the community garden spot. Stay fit in the exercise room, swim in the heated pool, walk on the lighted trails, crack jokes with friends around the fire pit or share the sunrise with that special someone at the lakeside gazebo. This area really is a retreat within Virginia. The Greenbrier part of Chesapeake is bubbling with activity but this community is a little oasis. It’s like having your cake and eating it too at this condo complex. Avid golfers can appreciate the courses at the Greenbrier Country Club and Stumpy Lake Country Club. Head over to the City View District Park for a nice picnic lunch. Whether you’re buying a townhouse, single-family home or quad-style house, you’ve come to the right place. The condo lifestyle is for anyone who can use more fun and less stress in his life. The new construction homes at The Retreat at Greenbrier are waiting- why are you? 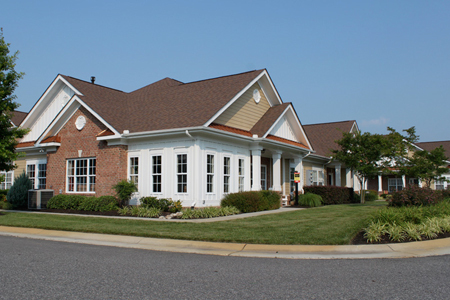 Send me more information about the The Retreat at Greenbrier (55+) new home community. Our agents gladly offer FREE property tours of The Retreat at Greenbrier (55+), Chesapeake and homebuyer consultations to all serious buyers.